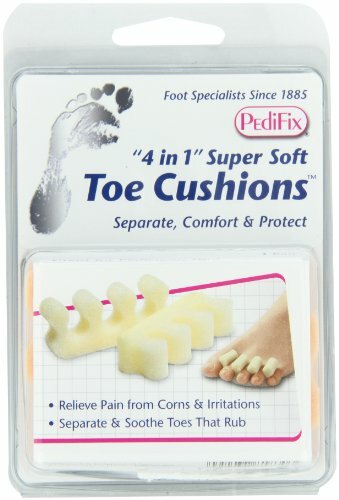 PediFix '4 in 1' Super-Soft Toe Cushions gently separate, cushion and protect toes. These extra-soft foam cushions divide toes to absorb pressure and friction while comforting corns and other toe irritations. '4 in 1' Super-Soft Toe Cushions help protect toe tops and tips, support bent-under 'hammer' toes and more. Wear on top or under, between toe, three, or all toes. Great for pedicures, too. Trim with scissors for a custom fit. One size fits most. Package of two. If you have any questions about this product by Pedifix, contact us by completing and submitting the form below. If you are looking for a specif part number, please include it with your message.